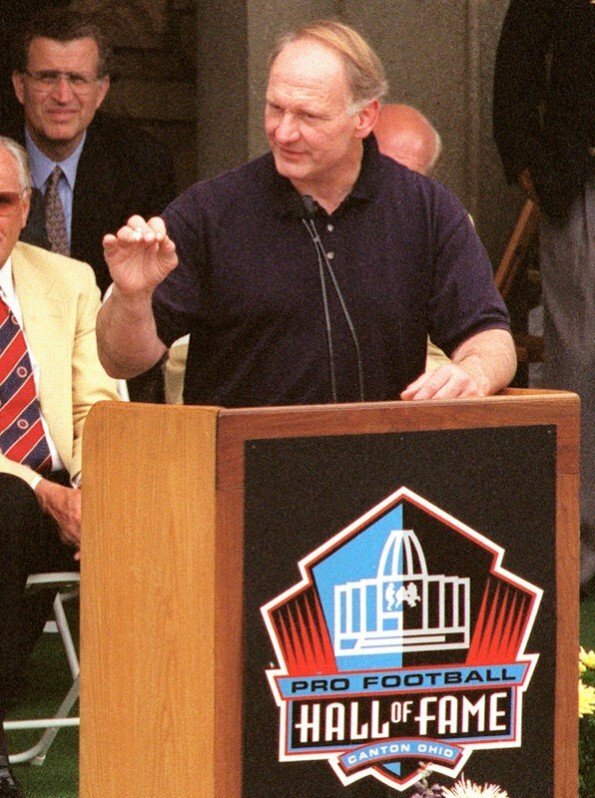 Heightened interest in brain injuries in football has brought the late Mike Webster, a former Badger standout shown here at his NFL Hall of Fame induction in 1997, back into the news. The story of the late Mike Webster, a former Badger standout shown here at his NFL Hall of Fame induction in 1997, figures prominently in the PBS Frontline documentary "League of Denial." Not long after he died, Mike Webster's brain wound up in a plastic tub that was sitting on a table in the living room of a Pittsburgh man named Bennet Omalu. Omalu, a forensic pathologist originally from Nigeria, was obsessed with Webster's brain. When he couldn't work on it enough in his office at the Allegheny County coroner's office, he took it home. What Omalu found then has the nation's attention now. Mike Webster was one of the greatest football players of his generation, a center for the Wisconsin Badgers and then the Pittsburgh Steelers. Born in Tomahawk, Webster was all-Big Ten with the Badgers and helped the Steelers win four Super Bowls during a pro career that landed him in the Pro Football Hall of Fame. But in the past week, both Webster's former wife, Pam Webster, and his son, Garrett Webster, told me separately that his greatness on the field will not be his true legacy. His real legacy involves what Bennet Omalu found while working in his living room back in 2002. And although neither Pam nor Garrett said it, that aspect of Webster's legacy is assured in part because of how hard his family fought for justice for themselves and for Mike's memory after his death. The subject of brain injuries in football has been in the spotlight in recent weeks, and Webster, who was 50 when he died in 2002, is again in the news. He figures prominently in a riveting article, "Brain Game," in the October issue of GQ magazine. That piece, by Jeanne Marie Laskas, details how Omalu discovered and named a disease, Chronic Traumatic Encephalopathy (CTE), that has been found in the brains of eight deceased former NFL players aged 36 to 52. Webster was the first. Last Friday, Garrett Webster was interviewed on the ABC News program "Nightline" in a segment on football brain injuries that also included interviews with Omalu and Julian Bailes, a former Steelers team doctor who is now chair of the Department of Neurosurgery at West Virginia University. That school is home to the Brain Injury Research Institute, where Garrett Webster, who is 25, now works as a liaison to NFL players and their families. He's uniquely qualified for the position. In 2000, Garrett was living with his mom and siblings and attending Lodi High School as a freshman. But when the school year was over, Garrett moved to Pittsburgh, in large part to try to take care of his dad, who was separated from Pam. "We all knew he was in a downward spiral," Garrett told me this week. Back when Garrett had turned 10, Mike came home to Wisconsin to attend the party, but he never made it to Lodi. Instead, he was in the Budgetel Inn in Madison, too sick and disoriented to come out of his dark room. In 1997, Mike had contacted a West Virginia attorney, Bob Fitzsimmons, who eventually sent Webster to four doctors, all of whom diagnosed brain injury due to multiple blows to the head. Yet the NFL fought paying Webster - and, after his death, his estate - what a football-related total disability should have yielded. A court case went on for years. Finally, in December 2006, the U.S. Court of Appeals upheld a lower court ruling that football injuries permanently disabled Mike Webster, resulting in an award of around $1.5 million for Pam and her four kids. Lately, there have been a few tentative signs that the NFL is ready to remove its head from the sand on this issue, even commissioning a study of its own. "We're not a group that points fingers," Garrett told me. "That's not going to accomplish anything. I think the NFL is treading very carefully. We're trying to grow our relationship with the league. Our goal is not to ban football." He thinks new equipment, perhaps better helmets, may be a part of the answer. The important thing right now is acknowledging a real issue exists, and no one who hears Mike Webster's story can doubt that. "His legacy," Garrett said, "is going to be how he helped people when he passed away."